Mahider offers exotic flavors at bargain prices. I've always felt a pang of guilt when walking past Mahider Ethiopian Restaurant & Market. That's because I only do it when I'm on my way to Tosh's Ramen restaurant, which is located in the same State Street strip mall. While there's often a line of customers waiting for a Tosh's table, Mahider doesn't seem to enjoy the same popularity or hustle and bustle. But maybe it should, especially given the big, bold flavors and tiny prices that make up a meal there. I first fell in love with Ethiopian food in Washington, D.C., which is home to many African restaurants thanks in part to all of the embassies and the international underpinnings of that city. Estimates place the Ethiopian population of D.C. at around a quarter-million. Later—and closer to my (then) home when I was attending graduate school—I would get my fixes of Ethiopian and Eritrean cuisine at a tiny New York City spot called Massawa, near the Cathedral of St. John the Divine. Those were lean times, and the leftovers from a dinner at Massawa could feed me for two or three days. That's the case with Mahider, too. You will not leave hungry. Portions are as massive as they are inexpensive, and more than once I've been approached by the restaurant's owner, saying, with a mischievous grin, "You can't leave until you finish all your food." Easier said than done. One thing I like about Ethiopian restaurants like Mahider is that I can bring my vegetarian and vegan friends there (yes, I do have some). Plenty of vegetable-, potato- and legume-based dishes are available, along with those for meateaters. There are a couple of things you can be certain of in an Ethiopian restaurant: There will be injera, and you will be encouraged to eat with your hands (although most African eateries reluctantly offer up forks and knives, if asked). As with breads like naan in India or Pakistan, or tortillas in Mexico, injera is a spongy type of bread used as an edible tool to scoop foods, and it anchors virtually every Ethiopian meal. Injera is made from teff, which is a species of lovegrass native to the northern Ethiopian Highlands, ground into a flour somewhat similar to buckwheat flour. Not only does injera serve to get food from the plate to your mouth, it pretty much is the plate: Most main courses are served directly atop a massive round of injera. I like to begin meals at Mahider with sambusa. Similar to the Indian samosa, a sambusa is a very popular Somali appetizer of lightly crusted pastry dough stuffed with meats, veggies, potatoes or lentils. The vegetable and lentil versions at Mahider are a mere $2.99 (for 2), but I really like the delicately spiced sambusa stuffed with ground beef, diced onions and jalapeño peppers. When I asked our server about the sauce that came alongside, he said, "I have no idea." This would be a recurring response to further questions about ingredients and such, which I found a bit odd. Wot (or wat) is an Ethiopian and Eritrean stew (often a curry) that can be prepared with any number of main ingredients. It's different from most stews of other cultures insofar as its preparation begins with red onions that are slow-cooked in a dry skillet with no fat or oils. Those are only added after the onions have given off most of their moisture. The breakdown of the onion serves to thicken the wot. Various iterations of wot include doro wot (chicken), shiro wot (split peas), yemisir wot (red lentils) and siga wot (beef). At Mahider, there's even a special kids' wot sampler called alicha ($3.99). And speaking of kids, there were a few families packed into the small Mahider space during my last visit; children seem to love eating with their hands. For those who are not so adventurous, elbow macaroni with meat sauce is also available ($3.99) as is kid-size tibs (beef tips). Many Ethiopian dishes are wonderfully spicy, and that's certainly the case with bozena shiro ($6.99). This is a dish of abundantly seasoned milled chick peas, which are simmered and served with cubed beef chunks in a spicy berbere sauce. Berbere is a vibrant and delicious, rust-colored spice mixture made up of ground chile peppers, garlic, ginger, basil, fenugreek, ajwain, nigella and more—one of the cornerstones of Ethiopian cooking. 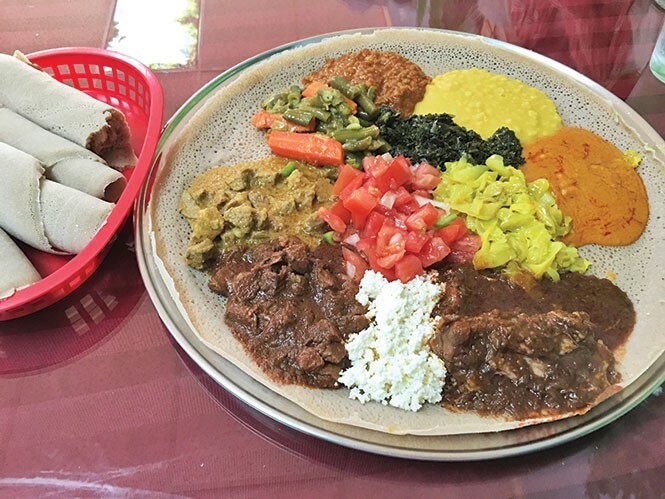 To enjoy a vast array of Mahider's Ethiopian flavors without having to order an abundance of different dishes, I highly recommend the restaurant's most popular offering: a gargantuan sampler plate called Taste of Mahider ($14.99). The price might vary a little, depending on whether you select certain meat or chicken items or stick with vegetarian fare. This particular meal is a selection of the restaurant's best dishes in sampler form, served on a large mesob (table-size serving tray or platter). The tray is literally covered in injera, with more injera served on the side. The sampler we tried included doro wot, vegetarian items and beef, plus a small salad and homemade cottage cheese. I loved the spicy (and messy) curried chicken doro wot, the creamy split pea shiro wot, stewed beef (siga wot) and the red lentil yemisir wot. I found the fesolia—a mixture of stewed green beans, carrots, tomatoes and onions—to be mushy and not too appealing. Braised collard greens and cooked cabbage on the platter were much more tantalizing. We ate until we were stuffed, and still hadn't finished half of our Mahider platter. That's a lot of exotic flavor for less than 20 bucks.